The selling in Gold finally bottomed this week, at least temporarily. The daily chart shows that Gold has been locked in a relentless decline for more than 20 trading days, so a pause was expected. Even though Gold’s decline looks severe, from a percentage standpoint, it was not anything too unusual. There is no shortage of creative bullish rationales to “explain away” the current decline, but as Cycle followers know, Gold remains in a bear market and the current decline is tracking past Cycles well. The ebb & flow of the bear market Cycles have been consistent, and the challenge has been in trying to determine when the Daily Cycles are making a turn. I am convinced that Gold just completed a Daily Cycle and has now begun its 4th, and final, DC of the current Investor Cycle. There is an outside chance that Gold just completed an ICL so won’t have another DC lower, but my primary view is that the new DC is the 4th of the IC. That being the case, I expect the new DC to be extremely Left Translated and short in duration. History shows many final Daily Cycles as short as 13 days, and because Gold is finally showing some ICL type behaviors, I expect the current DC will be just 15-18 days. Unfortunately, I see price falling sharply to a level under $1,000. 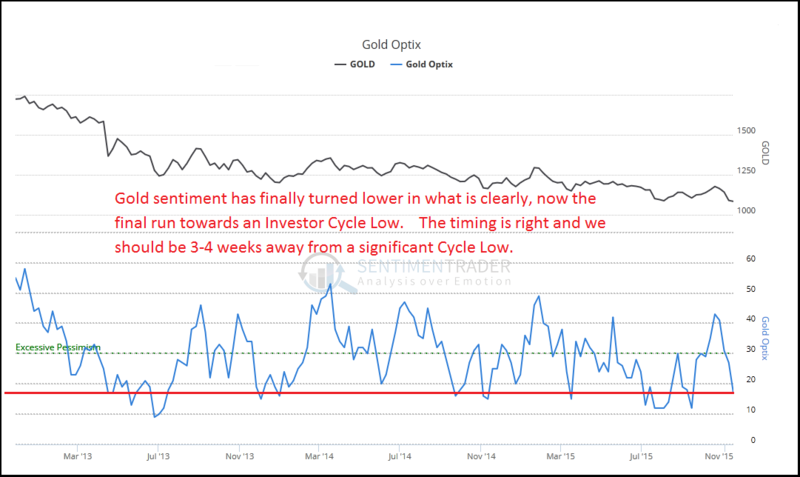 For several weeks, it has been clear that Gold was not ready to form an Investor Cycle Low. One of the primary tools suggesting that conclusion is Sentiment, which has not been negative enough for an ICL. This week, however, Sentiment turned decisively lower in what is clearly the final run to an Investor Cycle Low. 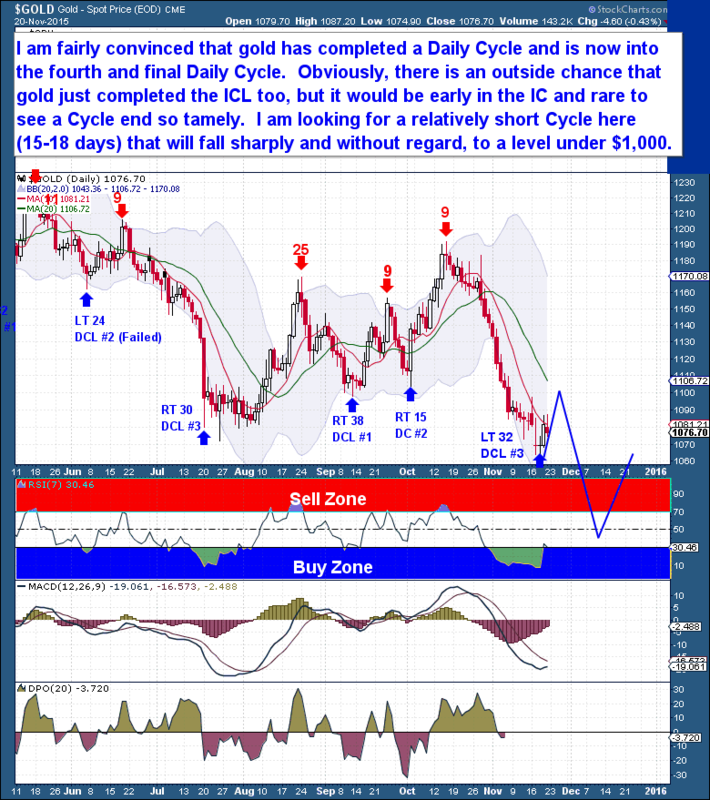 The current Investor Cycle is now moving into the timing band for an ICL, so Gold should be no more than 3-4 weeks – one short Daily Cycle – from a significant low. Along with Sentiment, Gold’s COT report suddenly looks bullish again. This is a significant change, and it appears that speculators have finally climbed aboard the Short side, while commercial traders continue to amass Long positions. Silver’s COT, however, is nowhere near ICL levels yet, suggesting that more speculators still need to join the Short side before we see a bottom. These are contrarian signals, so it’s a positive when they begin to line up well with levels from past ICLs. Keep in mind, though, that the COT report is not a timing tool, and often shows excessive readings for 2 to 4 weeks before price actually turns. We have seen previous Investor Cycles end after 18-19 weeks, so we must be open to the possibility that we just witnessed an early, 17 week ICL. I think it’s unlikely, but we can’t ignore the possibility. The current IC topped in week 12, and ICLs normally need more than 5 weeks to form. In addition, from a contrarian standpoint, Gold isn’t as oversold today as is normal at the bottom of an IC. Long time readers will know that I respect time and price action above all else, and that I avoid trying to get in front of moves where there is high reward but high risk. So before letting price dictate a turn, I like to see an IC run its normal 20-24 week duration. I’m not overly concerned about early Cycle turns; a big Cycle Low can always come at any time, but more often than not, Cycles run for their expected duration. If this means that I occasionally miss a turn or am forced out of a position by the unexpected, that’s the price I’m willing to pay for adhering to my trading discipline. Trading the expectation of an early Cycle Low is a losing strategy in the long term. 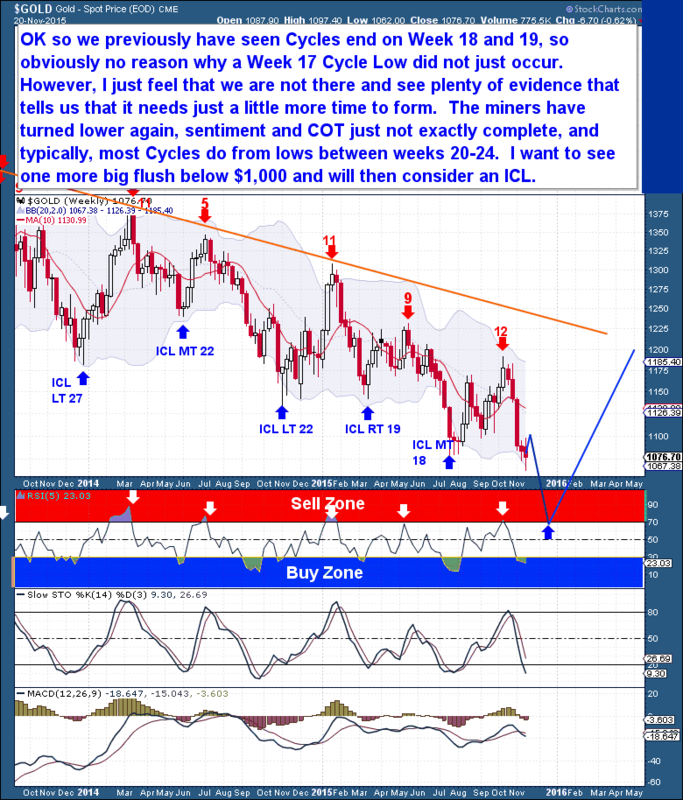 In summary, there are a number of reasons for my bearish view that Gold will have another Daily Cycle lower. The Miners turned lower to end the week and readers know that the Miners often lead Gold. In addition, as discussed above, Gold’s Sentiment and COT levels still seem short of a final low, although they have improved greatly in a week. Lastly, a typical Investor Cycle is 20-24 weeks, and the current IC (17 weeks) is well short of that. I’d like to see one more big flush below $1,000 to be comfortable concluding that the Investor Cycle has ended.